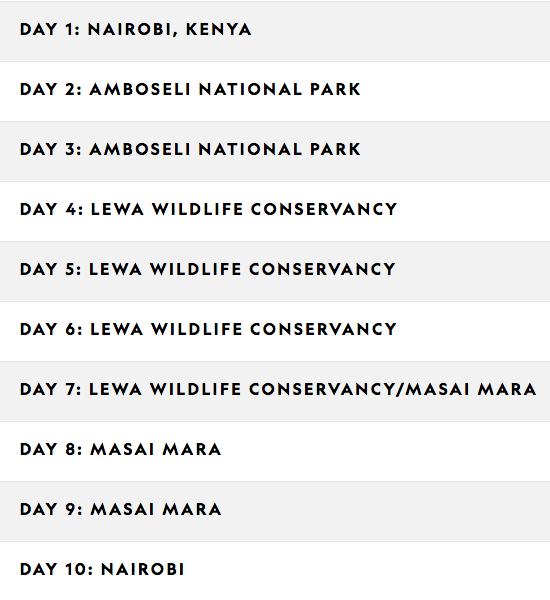 On a trip inspired by National Geographic-sponsored efforts to save Kenya's iconic wildlife, meet grantees working throughout the country to protect elephants, rhinos, and big cats. 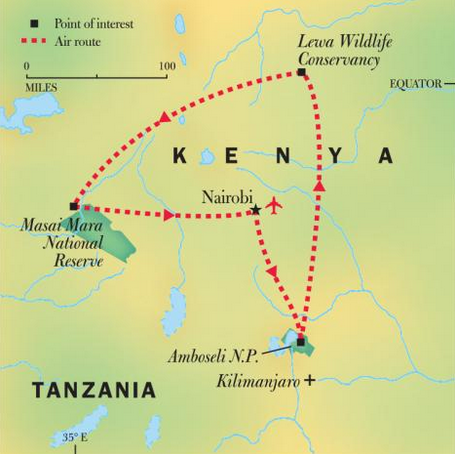 Set out on safari in three wildlife conservancies known for their high concentrations of African megafauna: Amboseli National Park, Lewa Wildlife Conservancy, and Masai Mara National Reserve. In Nairobi, interact with orphaned elephants at the renowned David Sheldrick Wildlife Trust, featured in the September 2011 issue of National Geographic magazine. Delve into Samburu culture during a village visit. Learn about wildlife conservation efforts carried out in partnership with local Maasai communities. In the rolling grasslands of southern Kenya, experience a fascinating and fragile ecosystem through the eyes of people dedicated to saving it. 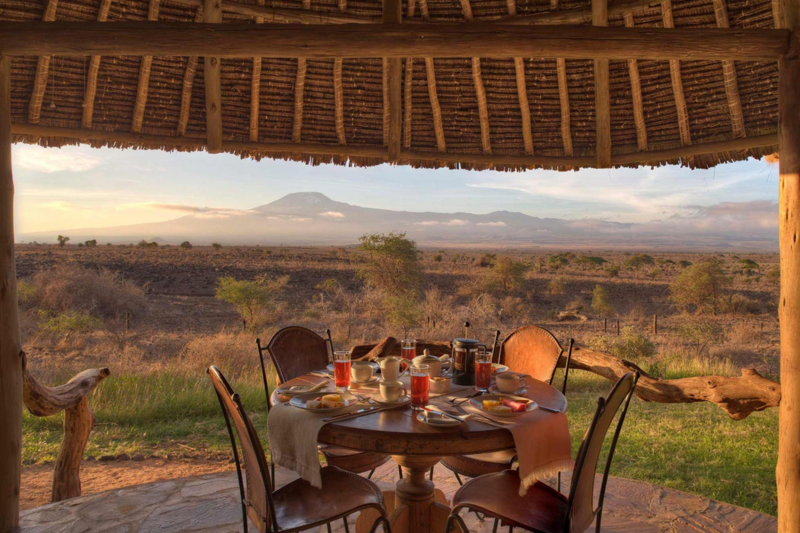 Embark on game drives in the shadow of Mount Kilimanjaro, and track rare species like African wild dogs and white and black rhinos through the thriving Lewa Wildlife Conservancy. In the legendary Masai Mara, observe herds of zebras and wildebeests—and the fierce predators that hunt them. Along the way, meet researchers, wildlife biologists, and conservationists who are confronting poaching and habitat loss in East Africa head-on. This premium-service expedition is rated as light; travelers should be in good health and comfortable sitting for extended periods of time. Excursions include safari drives in open vehicles on dusty, bumpy roads; nature walks on uneven terrain; and sometimes climbing stairs without handrails. Throughout the expedition, we stay in luxury safari tented camps and a high-end hotel in Nairobi with many amenities. Our accommodations are selected for their exceptional quality, location, and character. A National Geographic expert and an expedition leader will accompany this trip, and local guides join us along the way. · Some 2018 dates still remaining; 2019 and 2020 dates available. Prices are per person based on double or single occupancy (unless otherwise noted) and do not include international airfare to/from your destination or internal flights during the expedition. Internal flights are $1650 per person in 2019. Internal flights for the optional extension to Rwanda are $1100 per person in 2019. All prices and fares are quoted in U.S. dollars and subject to change. Other terms and conditions apply.